Description: It allow to save and restore the desktop icon layout. In Windows, when screen resolution changes, the order of the desktop icons very often gets mixed up. 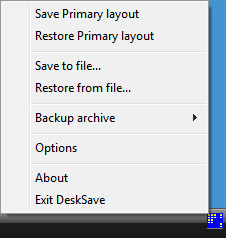 With with this application it is quite easy to recover a previously saved icon layout either manually or automatically.